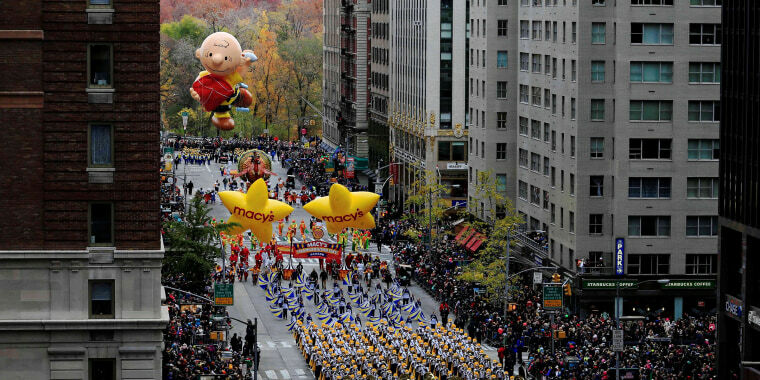 This year marks the 92nd annual Macy's Thanksgiving Day Parade! Everyone has their own Thanksgiving traditions, whether you're running in a turkey trot, cooking all day, or preparing to go to a restaurant, but nothing says "Thanksgiving" more than watching the Macy's Thanksgiving Day Parade. This year, in addition to the larger-than-life balloons and classic floats, you can expect performances from Diana Ross, John Legend, the Muppets of "Sesame Street," Ashley Tisdale and more. Find the full list of performers and floats here. We have all the details you need in order to watch this year's Macy's Thanksgiving Day Parade. What time does the Macy's parade start? The Macy's Thanksgiving Day Parade will start at 9:00 a.m. on Thursday, November 22 and will run until noon. What channel is the Macy's Thanksgiving Day Parade on? Savannah Guthrie, Hoda Kotb and Al Roker will host NBC's 66th annual broadcast of the parade, which starts at 9:00 a.m. NBC will also show an encore presentation at 2:00 p.m.
We're all used to seeing Al take to the streets of New York on foot to give a unique glimpse into what's going on at the parade site, but this year he will make his appearance on a motorcycle. His rig will offer 360-degree views of the spectators, balloons, floats and more. Stay tuned to NBC after the parade for the National Dog Show. CBS is also airing the parade with "Entertainment Tonight" anchors Kevin Frazier and Keltie Knight. According to a CBS press release, they will feature "portions of the 92nd Annual Macy's Thanksgiving Day Parade live from New York City." TV aside, you can view the Macy's Thanksgiving Day Parade online at nbc.com/live and on the NBC app. Verizon’s YouTube channel will also be streaming 360-degree lives stream of the parade. This will be hosted by Keith Habersberger from Buzzfeed and Zuri Hall from E! Going to be in New York City on Thanksgiving Day? Here's all you need to know about how to watch the Macy’s Thanksgiving parade in person. Starting at 6 a.m., you can begin camping out on the west side of Central Park West from West 75th Street to West 79th Street. Pro tip: Set up here to secure a good view of the parade. The official parade kickoff is at 9 a.m. at West 77th Street and Central Park West. Unfortunately, there will be limited to no public viewing here — and as the parade journeys down from Central Park West to Columbus Circle, turning onto Central Park South, viewing access is still denied to the public. The parade continues down West 59th Street until it reaches Sixth Avenue, where it will head south to West 38th Street. This stretch features some of the last quality viewing spots, as the parade comes to an end. And for the grand finale — the parade makes its final turn on West 34th Street and Sixth Avenue, stopping in front of Macy’s Herald Square. You can find the official 2 1/2 mile mile parade route here!